George is not your average 10-year-old goldfish. As reported by the Harold Sun, while other fish were relaxing in their underwater castles, George was actually going under the knife for brain surgery—yes, you read the right. 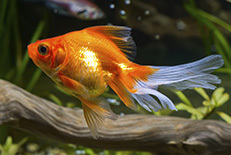 George the goldfish had a tumor removed from his brain that was half the size of his head! The Washington Post said that Pip Joyce and Lyn Orton, George’s guardians, were given two options: either they put their beloved George down or pay for a life-saving, yet high risk, operation to remove the tumor. Orton and Joyce made the choice to save George. “They’re not just things in the water—they’re characters,” said Orton to Harold Sun reporter Andrea Hamblin. the pair didn’t hesitate to pay the $200 for the operation. The operation, offered by Dr. Tristan Rich, a veterinarian at Lort Smith Animal Hospital, had been “quite fiddly,” said Dr. Rich. Because George is so small, if he had lost even .5 millimeters of blood, he could have died. Since having the surgery, it looks like George could have as many as 20 more years to just keep swimming, just keep swimming, just keep swimming! This is one tough goldfish!